People tend to buy brands when it comes to huge investments such as pool pumps. However, though brands are reliable for their performance, they are not necessarily the best options when it comes to pool pumps in terms of money. Less known brands such as Harris offer the same performance levels as brand names at less cost and with the same durability. Why pay more for a product that you can get at much less? Here are the reasons why you should consider getting a Harris pump and deviate from the expected. The filter basket that comes with the pump is very easy to clean and it is so big that you will only clean it after extended periods of time due to its ability to hold large amounts of debris. To make it easy for you to tell when the basket needs to be cleaned, a clear cover has been installed in the strainer. To maintain the pump easily during winter, a drain plug has been added to the ensemble for convenience purposes. This pump comes with a one year warranty which should cover you for damages that come to the pump through no fault of your own. Unlike most warranties that take so long to be honored that you end up getting another pump elsewhere, this warranty will be adhered to by the manufacturer as provided. The motor shaft is made of stainless steel which is not only strong but can also withstand corrosion induced by exposure to moisture. To further enhance the durability of the motor, its construction has been enhanced by the use of thermoplastic material which is also corrosion resistant, adding to the number of years of service you should expect from this pump. A seal of double size has been used to protect the pump and it is absolutely leak proof to ensure that no water can get to the motor and damage the pump. The seal is also heat resistant to add to the long life of the motor. These features make it possible for you to use the pump in various weather conditions without running the risk of damaging the pump. They also enable the pump to run while making much less noise when compared to traditional pumps. The pump has been designed in a way that it meets the required CSA and ETL standards. The pump can be used in different ranges of horsepower that include: ¾, 1, and 1 ½. 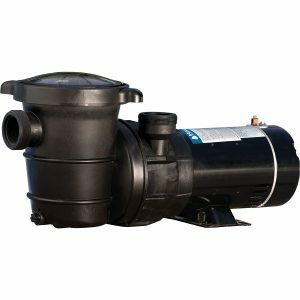 No matter how much power you need to flush out those toxins from your pool, this pump has got you covered.